If you just can’t wait until dinner to get your pizza fix, Nick & Toni’s has you covered. Their brunch menu, served on Sundays from 11:30 am to 2:30 pm, offers an assortment of tantalizing pies, from classic margherita to asparagi pizza served with shaved asparagus, taleggio and black truffles. If you’re looking for a taste of the “upper crust”, head to Mirabelle’s Restaurant and Tavern at the Three Village Inn in Farmingdale. 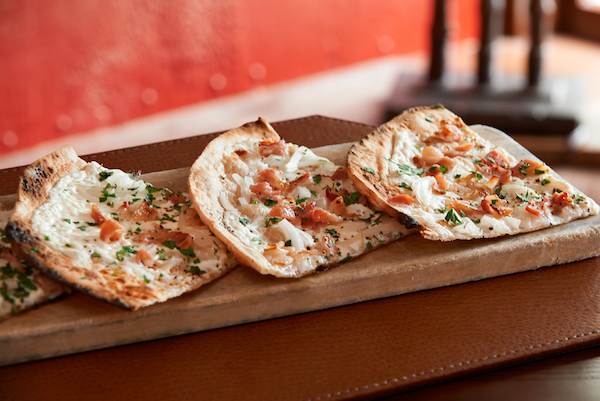 Take a break from tradition and indulge in their ‘Flammkuchen’ Alsatian thin crust pizza served with bacon, onion, and sour cream. Talk about a slice of heaven! This Rockville Centre restaurant has earned a reputation for serving some of the best pizza in Long Island, and with a menu as expansive as theirs, it’s no surprise. In addition to serving every variety of pizza that you can imagine, they also boast an impressive selection of desserts, as well as other authentic Italian delicacies. Located in Huntington, Restaurant Joanina is a must if you’re looking for a slice of heaven. This charming Italian restaurant offers a plethora of delicious dishes, including pizzas made fresh in a wood-fired oven. We recommend their pizza buon gusto served with grilled chicken, grilled vegetables, homemade mozzarella and fresh tomato sauce!